Common Seal Stamps for Incorporated Societies. Common seal rubber stamps and digital stamps made right here in New Zealand for all incorporated societies. About,Common Seal Stamps for Incorporated Societies. According to New Zealand Companies Office, “All societies must adopt a common seal on incorporation. The rules of the society will set out when the common seal should be used and how. Generally it is used on legal documents and contracts that the society enters into. A common seal is usually a rubber stamp that includes the name of the society and the words ‘common seal”. See Official Page Here. The format and size of the common seal rubber stamp is not prescriptive and thus styles, sizing and wording varies from institution to institution. All that is required according to the interpretation of New Zealand Companies Office are the two main elements of ‘name of the society’ and the words ‘common seal’. Stamps Plus has found no evidence of it being mandatory to have the society’s registration number, but some administrators select to include this due to personal choice or preference. 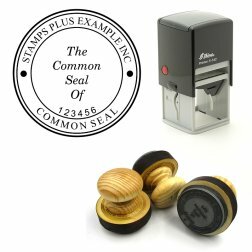 We at Stamps Plus have a comprehensive variety of settings, styles and formats to accommodate personal preferences of the administrators and we have even introduced and mastered a unique offering in our ‘digitised common seal rubber stamp’. If your incorporated society is a ‘body corporate’, ‘charitable trust’, ‘discretionary trust’ or any other incorporated society, we can help you with your common seal rubber stamp. If on the other hand your private or incorporated trading company requires a common seal stamp for trading with overseas companies, we can help with the same process as described in our next paragraph “Easy processes or information gathering for your common seal stamp”. Easy processes or information gathering for your common seal stamp. • Go straight to our online e-commerce platform linked here and follow the prompts. Some more resources and history regarding common seal stamps. If you are in need of a professionally made, properly laid out common seal stamp crafted right here in New Zealand and want to pay a fair price with a quick turnaround time; Stamps Plus can help you right now.